With Tim Burton's revisionist 3D flick Alice hitting theaters this Friday, it's time to revisit the origin story: Lewis Carroll's original novel. Why has this story endured, and been championed by artistic rebels from 1960s hippies to today's steampunks? Though there have been many movie and cartoon versions of Carroll's mid-19th century novel of nonsense, it seems to me that perhaps the best adaptations and transformations of it didn't break until the mid-20th century with Jefferson Airplane's iconic song "White Rabbit." This song is, among other things, a terrific entry in the fantasy genre. It evokes the foolish/horrific mood that permeates Carroll's original tale, and updates the story to reflect the 1960s countercultural fascination with psychedelics. Just as they do today, neo-Victorian fashions flourished during the 1960s in America - especially if those fashions had an Old West flair. Hippies in America were fleeing West to California, and many bands that emerged from the Haight Ashbury scene referenced that idea with 19th century "cowboys and Indians" garb. I would call this kind of imagery, which you can see here in album cover art for Haight Ashbury bands The Charlatans and Quicksilver Messenger Service, among the first stirrings of steampunk sensibilities in the United States. Of course we could argue for a year about what steampunk means, so let me say that I'm borrowing heavily from the definitions of steampunk as an artistic movement in Ann and Jeff VanderMeer's Steampunk anthology. In that anthology, the VanderMeers refer to steampunk as "dark pseudo-Victorian fun." They emphasize the DiY artistic styles that have given rise to steampunk culture and aesthetics, as well as steampunk literature. Many authors, including those in the VanderMeers' anthology, cite Jules Verne, H.P. Lovecraft, and H.G. Wells' work as obvious precursors to today's massive crop of steampunk novels. And pulp historian Jess Nevins says the dynamo-driven, monstery tales of today have their origins in the "Edisonade," a subgenre of tales from the nineteenth century where an intrepid inventor makes a steampunk gadget and has an adventure with it. So where does Alice's Adventures In Wonderland come into all this? The novel is certainly not a gadgety Edisonade, nor does it have the epic scope of a Jules Verne adventure. And yet its vision of a Victorian girl gone mad among even madder humanoids, her body an uncontrollable mass of growing and shrinking limbs, is as much a part of the steampunk tradition as any manly adventurer with his rational machine. Instead of the madness of engineering and pistons, Carroll's novel explored the glorious madness of human psychology. As his protagonist Alice moves from dreamy encounter to dreamy encounter, watching nursery rhymes coming to life and fighting bloodthirsty monarchs made of cards, we witness something that for the Victorians was just as stunning as a giant dynamo. Psychiatry was in its infancy in the 19th century, and this brave new science suggested there was a method in madness. The muddle of our dreams might illuminate the truth about human consciousness; the murmurings of madwomen could shed light on how so-called sane people think. Carroll, a lifelong fan of wordplay and logic games, reflected a Victorian fascination with the inner workings of the human mind. Especially when it was at its most nonsensical. One of the other truly great adaptations of Carroll's work, the 21st century videogame Alice from American McGee, foregrounds this idea. In that game, which takes place many years after the events of Alice's Adventures Through the Looking Glass, Alice has been incarcerated in an insane asylum for nearly a decade. She escapes back to a very dark version of Wonderland when the white rabbit comes asking for help. Here's an unofficial teaser for the Alice videogame sequel, due out next year, which captures the madness. This is precisely the kind of "dark pseudo-Victorian fun" that steampunk celebrates. Another way Carroll's novel has influenced steampunk is through the often-imitated original drawings of John Tenniel. The image of Alice with that trippy caterpillar, which appears in the Jefferson Airplane song as well as countless works of concept art, has become visual shorthand for glorious Victorian madness. Tenniel-inspired garb is not uncommon among steampunks and steamgoths. Carroll's novel belongs at the heart of the steampunk tradition because it represents a perfect wedding of escapism and protest. And that, in the end, could sum up steampunk too. Steampunk caterpillar and windup Alice by Guillaume Dubois. 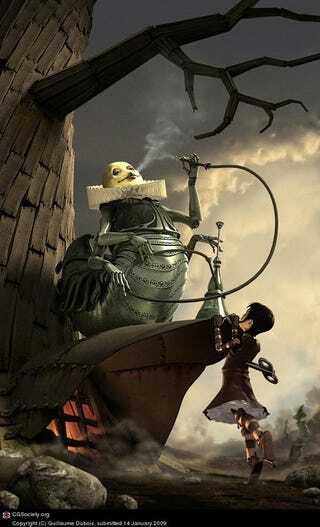 Alice vs. snails from concept art for the videogame Alice via American McGee.